Nanotechnology, the manipulation of matter at the scale of atoms and molecules, is rapidly converging with biotech and information technology to radically change food and agricultural systems. Over the next two decades, the impacts of nano-scale convergence on farmers and food will exceed that of farm mechanisation or of the Green Revolution. No government has developed a regulatory regime that addresses the nano-scale or the societal impacts of the invisibly small. A handful of food and nutrition products containing invisible and unregulated nano-scale additives are already commercially available. Likewise, a number of pesticides formulated at the nano-scale are on the market and have been released in the environment. 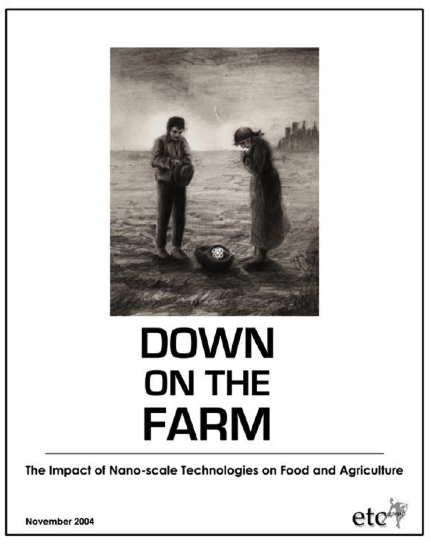 "Down on the Farm" is the first comprehensive look at how nano-scale technologies will affect farmers, food and agriculture. No government has developed a regulatory regime that addresses the nano-scale or the societal impacts of the invisibly small. A handful of food and nutrition products containing invisible and unregulated nano-scale additives are already commercially available. Likewise, a number of pesticides formulated at the nano-scale are on the market and have been released in the environment.